Rhenus Contract Logistics has started using an AutoStore system at its new 60,000 sq m distribution centre at Tilberg in the south of the Netherlands. AutoStore uses robots that run on an aluminium grid. 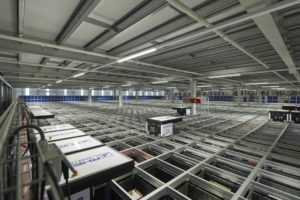 The robots stack bins in the storage system grid, and then transport items for delivery to the order picking stations. Aisles are superfluous, making for an unusually compact automated storage and picking system. The AutoStore system, provided by Swisslog, has a surface area of 1,000 sqm, and is equipped with 21,000 containers, 19 robots, two infeed and three order picking ports. The 3PL said the robotic system would enable it to serve more customers. “The AutoStore system assists in further improving the accuracy of its ordering picking and in fulfilling the customers’ growth needs through optimization of continuity and quality.” It said.